It doesn’t make sense. At least not this side of heaven. Cancer stealing years from folks who live and love well while rapists continue their lust for power and flesh. Infertility leaving wombs and arms empty while others abandon and abuse their children. Addiction powerfully pulling its prey away from work, family, friends. A momentary lapse of judgment, a text message flashes, and a fatal crash tears apart a family. Depression wins a victory and a family is left with one empty chair. There are dark paths in this life when questions ring louder than answers and grief marks every step. Where words do little to soothe aching souls and there is no perfect way to tie up the darkness in a beautiful present. How do we support people walking down paths of indescribable grief? Text, call, e-mail, and pray. Don’t wait for the one who is struggling to reach out to you. They cannot see beyond the darkness of their path so reach out to them. Let them know you are praying for them. Ask them if you can bring them a meal or take them for coffee. Find some way to help lighten their load. Admit you don’t know what to say. It is ok to not have the answers. It is ok to say I am sorry. I am grieving with you. We may be clumsy in our encouragement, but better clumsy than not at all. Refrain from offering trite answers. God’s promises are comforting, but in the midst of the blackness of some paths they can also burn like acid. Be aware that reminding folks God will work everything out for good may not be appropriate. Pray for wisdom. Let the one walking the dark paths guide the discussion. Pray they experience God’s nearness and comfort. In the darkness it is easy to lose sight of God’s nearness. Still God is the God of all comfort. So pray they experience God’s nearness and comfort in the midst of the darkness. Encourage them to wrestle with God. Much of Lamentations and Psalms are just that. People wondering where God is in the midst of difficult times. People asking God how long He will wait, where is He, and yet reminding themselves to hope in God. While in the darkness if we cling to God we can hear His still small voice whispering words of hope, correction, promise, and encouragement. Please don’t look to them for comfort. Often we feel the grief of those walking dark paths so strongly that we bring our questions and tears to them. Please cry with them, but do not force them to become comforters in their grief. 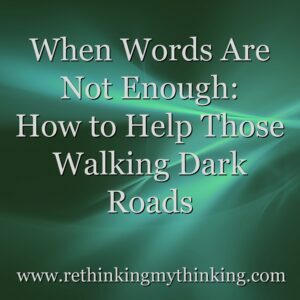 What has helped you as you have walked dark paths? This entry was posted in Rethinking Challenges, Rethinking Hard Times, Rethinking Life, Wrestling with God. Bookmark the permalink. ← How Do You Love a God Who is Able, But May Not? Just had to put my Annie girl dog to sleep, she was so sick. Wednesday at 4pm we all said our goodbyes. Very heartbreaking! Dogs are such an important part of our families. I am praying God has and is comforting you during this time.